Halite crystal (sodium chloride) occurs in seawater, along with other salts of sodium, calcium, magnesium, and other light metals. When seawater evaporates in a closed lagoon, halite and other minerals precipitate out and sink to the bottom as crystals. In this way, great beds of rock salt have been formed. Pure halite is colorless, though it is often colored by impurities. It is soft and breaks (cleaves) into cubes. Halite crystallizes in the isometric (also called cubic) crystal system and when it forms crystals, it generally forms cubes. Its most noticeable and important physical feature is that halite is readily soluble in water. This allows halite to be useful in such varied applications as cooking, food preservation, and chemical production. Salt can be mined from rock salt either by traditional mining practices using heavy equipment underground, or by pumping hot water in pipes into the salt deposit, where the hot water dissolves the halite. The resulting salt water is then pumped to surface and evaporated to yield salt. This is called “solution mining”. In some modern dry salt lakes, a crust of halite can be recovered by simply scraping the salt crust off the lake bottom with bulldozers or scrapers. Ancient rock salt is mined in Michigan, New York, Kansas, and other states. Solution mining is used to recover salt from underground “salt domes” in Louisiana and Texas. Recovery of salt from dry lakes takes place in the deserts of California, Nevada, and Utah. Table salt is actually 97.5 percent sodium chloride and 2.5 percent chemicals such as moisture absorbents, and iodine. Dried at over 1,200 degrees Fahrenheit, the excessive heat alters the natural chemical structure of the salt causing the potential for many health problems in your body. Table salt is not recommended in your healing arsenal. The mineral content of the Dead Sea is significantly different from that of ocean water, consisting of approximately 53% magnesium chloride, 37 percent potassium chloride and 8% sodium chloride (common salt) with the remainder comprised of various trace elements. The concentration of sulfate, SO42-, ions is very low, and the bromide ion concentration is the highest of all waters on Earth. Chlorides neutralize most of the calcium ions in the Dead Sea and its surroundings. While in other seas sodium chloride is 97% of the salts, in the Dead Sea the quantity of NaCl is only 12-18 percent. Comparison between the chemical composition of the Dead Sea to other lakes and oceans show that the salt concentration in the Dead Sea is 31.5 percent (the salinity fluctuates somewhat). Because of its unusually high concentration of salt, anyone can easily float in the Dead Sea because of natural buoyancy as a result of the higher density of the water. You can purchase pure, high-quality Sea Salt and Epsom Salts at StarWest Botanicals! This salt is unparalleled in the world. Less than 1 percent of the world's salt harvest has the quality of Celtic Sea Salt. Pure, moist, biologically active, and free from any chemicals or additives, this is considered “living sea salt”. Celts discovered a way to harvest salt from the ocean using the sun, the wind, and shallow clay ponds. Pristine ocean channels spiral water into the concentrating ponds. The live flowing mixture is carefully stirred by the salt farmer, and dazzling crystals form and are gathered by hand. The ionizing action of the clay, combined with the artisan's skillful method, passed down through generations, enlivens the unique, bioavailable array of trace elements that exist in a perfectly balanced matrix. This salt is a rich source of magnesium. Magnesium helps to regulate the activity of more than 325 enzymes and performs a vital role in orchestrating many bodily functions, from muscle control and electrical impulses to energy production and the elimination of harmful toxins. Epsom Salt also delivers sulfates, which are extremely difficult to get through food but which readily absorb through the skin. Sulfates serve a wide variety of functions in the body, playing a vital role in the formation of brain tissue, joint proteins and the mucin proteins that line the walls of the digestive tract. Sulfates also stimulate the pancreas to generate digestive enzymes and are believed to help detoxify the body's residue of medicines and environmental contaminants. Soak in a tub full of hot water with a few cups of Epsom Salts. This is good for relaxing muscles and drawing toxins from the body. When magnesium sulfate is absorbed through the skin, such as in a bath, it draws toxins from the body, sedates the nervous system, reduces swelling, relaxes muscles, is a natural emollient, exfoliator, and much more. Soak for 15-20 minutes. Himalayan Crystal Salt is salt in its native form, with all its vibrational energy intact and it helps your body return to a state of balance. Not having balanced electrolytes shifts your body out of homeostasis – the balance of chemicals that is conducive to the body's function. The renowned Frezenius Institute in Europe analyzed the Himalayan Crystal Salt and proved that it has an amazing array of important trace minerals and elements including potassium, calcium and magnesium that help your body achieve balance by restoring fluids and replenishing your supply of electrolytes whenever you sweat heavily. The salt water healing abilities are profound and well documented. Salt water is an astringent and speeds wound healing. Floating in sea water is an extreme release of tension and stress of the day. Allow yourself to float weightlessly in the water. Salt water healing – You deserve it. Thalassotherapy (from the Greek word thalassos, meaning “sea”) is the medical use of seawater. The properties of seawater are believed to have beneficial effects upon the pores of the skin. Thalassotherapy was developed in seaside towns in France during the 19th century. Trace elements of magnesium, potassium, calcium sulphates and sodium, found in seawater, are believed to be absorbed through the skin. The therapy is applied in various forms, as either showers of warmed seawater, application of marine mud or of algae paste, or the inhalation of sea fog. Spas make hot seawater and provide mud- and seaweed wrapping services available. Entering bacteria gets trapped and filtered out by mucus and minute nasal hairs called cilia. This air-flow system can sometimes slow down when something impedes the cilia, if a cold clogs the sinus openings, or if an allergen swells the sinus linings. Then air gets trapped, pressure builds, the mucus stagnates, and bacteria breed. Infection sets in and you have sinusitis. When you get clogged up, you may end up with a permanent thickening of the sinus membranes and chronic congestion. Thoroughly Mix all dry ingredients, then drizzle Glycerin and EO's over them. Mix them well and store in an air tight container for several days prior to use. Mix well. Place all ingredients in a hot bath and bathe for 20 Minutes Drink plenty of water. This bath withdraws impurities from your body and helps you to feel better. This bath can be done 2 to 3 times in a week or as needed. Energy in itself, is the vital source, which radiates from everything and everyone around us. When we are ill, emotionally upset, angered or imbalanced, our moods and of course, our energy is altered. Coming in contact with energy that is negative can often be sensed, even felt. The result is often a feeling of uneasiness, confusion or an opposed feeling to our current state of mind. Cleansing your crystals can be done by placing a teaspoon of sea salt into a bowl of lukewarm water. Make sure the salt is dissolved, then place your crystals in the water for twenty four hours. Adding herbs or oils to sea salt can give an added bonus to cleansing. Herbs such as lavender, sandalwood, tea tree, thyme, are all good complements. When using herbs, place them in the salt and shake the salt in a closed container. This bruises the herbs and allows its oils to incorporate into the salt matrix. When using oils, add a few drops to salt and then stir or shake the salt in order to mix them well. 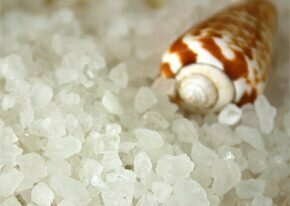 Hello Dee, thank you for writing the entry on healing with sea salt. I just wanted to tell you my story. About 1 month ago I got the H1N1 virus and I was pretty sick or almost 2 weeks, I have never had a problem with allergies or asthma until this virus got hold of my lungs. Thank goodness I have no underlying conditions that warrented me to go into the hospital. But I continued to have asthma attacks that would last for 12 hours at a time with little recovery time inbetween. FYI I am a smoker who had dry hacking smokers cough. Wow, what a good move on my part. My sinus cavity is much clearer now and I am no longer wheezing at all and I have not had asthma attack as of yet. I take full deep breaths without coughing. And I noticed positive effects in the first 24 hours. I have coughed up a lot of sputum (sp?) the first that came out was thick, yellow and brown now it is clear, thin and bubblie. I began by using it twice daily for 15 min each now I am once a day at my convience when I am setting at the computer. I plan to continue with this therapy and may drop down to every other day to see how that works for me. No side effects what so ever except for the coughing up of sputum which is what you want to happen. So I recommend the sea salt therapy for allergies and asthma and of course smokers who want to clear there lungs. What a great story! Thank you so much for sharing your experiences with this – i’m sure they will help someone else heal.